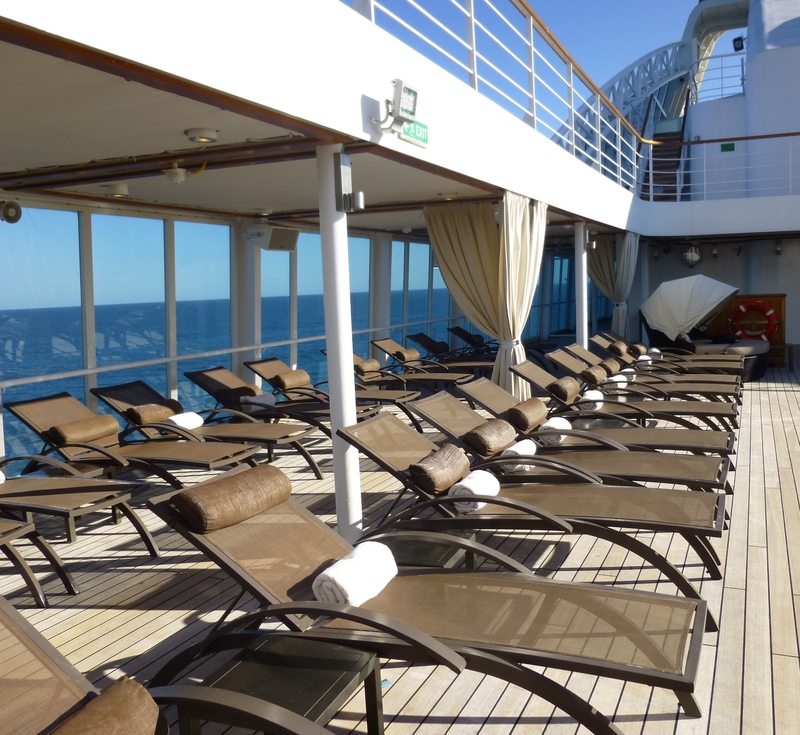 Our first day at sea and it doesn’t take long to see why Seabourn is so highly rated. I go out to the pool where the chaises are lined up with such precision they remind me of a platoon of sailors. Even before I can settle on to my chaise of choice a nice young man in crisp black shorts, a tan polo shirt and a white cap, approaches me holding a small tray. For one terrible moment I think he is going to chirp “Cigarettes, Cigarillos”, but instead he proffers a small, expensive array of suntan creams and indicates that I can select one – at no charge. I apply the sun tan and settle back, listening to the Fabulosity Meter chirping happily in the background. The next intrusion, albeit it a welcome one, is from another young man, dressed much as the last, asking whether I would like a glass of champagne or a glass of water. I forgive him. It is my first day on board and he has no idea what a silly question that is. I accept the champagne. Glass in hand, I reach for my book and my reading glasses. Immediately a voice from behind asks if I would like to have my spectacles cleaned. This is not an offer that has been made often in my life so somewhat surprised, I turn to see where the voice is coming from. I find myself looking up into the eyes of a dashingly handsome Latin man in his late twenties. His smile shows off a perfect row of gleamingly white teeth that I am sure could be donated to a piano factory on his death. He is dressed exactly the same as the last two men, but on him the uniform has a completely different effect. He looks as if he has stepped off the beach at Copacabana. I want to tell him that he can clean anything he wants, but instead I find myself mumbling something about this being just my first glass of champagne and I am still quite capable of cleaning my glasses. I do find persistence in a handsome young man an attractive quality, don’t you? While I am still trying to put a sentence together, he gently removes the glasses from my hand, sprays them with something that smells a lot nicer than windex and then proceeds to polish them for some time, periodically holding them up to check for any smears that he may have missed. He even cleans the arms of the glasses. I sigh, wishing that I was wearing the glasses at the time. They are the cleanest pair of glasses I have ever worn. He smiles that smile, and says to just let him know when they need cleaning again. The Fabulosity Meter is going crazy. It is at least thirty minutes before the next person comes by. This time it is a young lady with a tray of ice cold flannels, inviting me to chose one so that I can wipe the beads of perspiration off my face. I do this and then discreetly smear the flannel all over my glasses, hoping that the young man will suddenly appear to clean them again. I wait for that voice to come from behind, but nothing. I even casually wave my glasses in the air hoping that it might attract him, but he has clearly moved on, ending our relationship before it has even begun. I can no longer read my book because my glasses are so dirty. As I am deciding on my next diversion one more young man comes to my chaise. This one is offering a skewer of melon cubes. Each cube cut to exactly the same size as the next and each from a different coloured melon. There are four cubes in all with a grape at the end. The entire thing has been sat in a fridge for a couple of hours chilling to the perfect temperature for a hot sunny day. It has taken 66 years, but finally I think I have found a place I could call home! This entry was posted in Seabourn. Bookmark the permalink. 13 Responses to There’s No Place Like Home! I know exactly how you feel on Seabourne, Andrew. It’s just the best service at sea. But wait until they pull up a private island in the Caribbean for a beach day and the caviar starts flowing delivered by the male staff standing waist deep in the blue seas in full white dress! Storytelling at it’s best, but where is Gordon??? I am absolutely ready for this! Sounds wonderful!!! Can you do that cruise line “straight, old and married, and a breast cancer survivor”? Yep, where’s Gordon? Sounds like my day here in Ubud yesterday, first day to have my glasses cleaned by a cute young man and served cold watermelon by the pool, lets enjoy!! I kept telling you Seabourne was the way to go! I was sure you said Princess!!!!!!! I back Paul 100%. 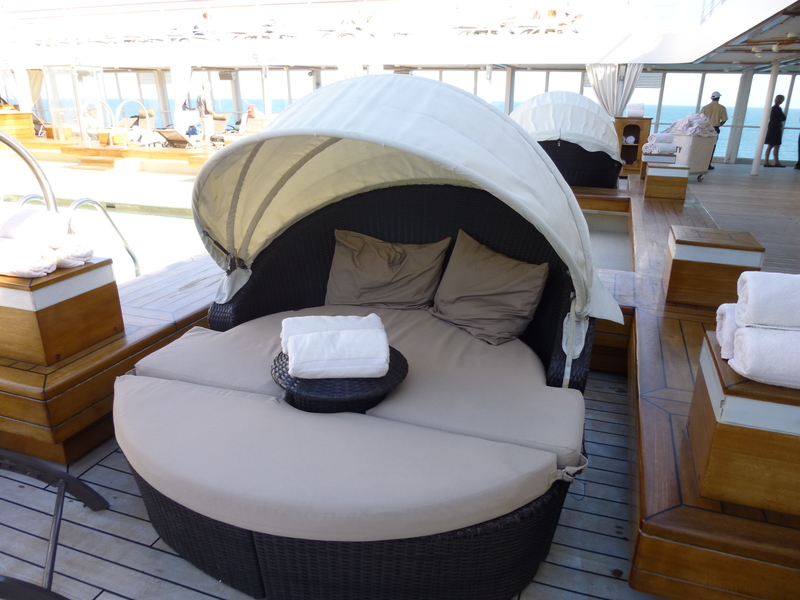 We’ve done three Seabourn cruises and have always been impressed. Who is Paul Pimlett, anyway? Why have we not met? John, this is not a dating service! 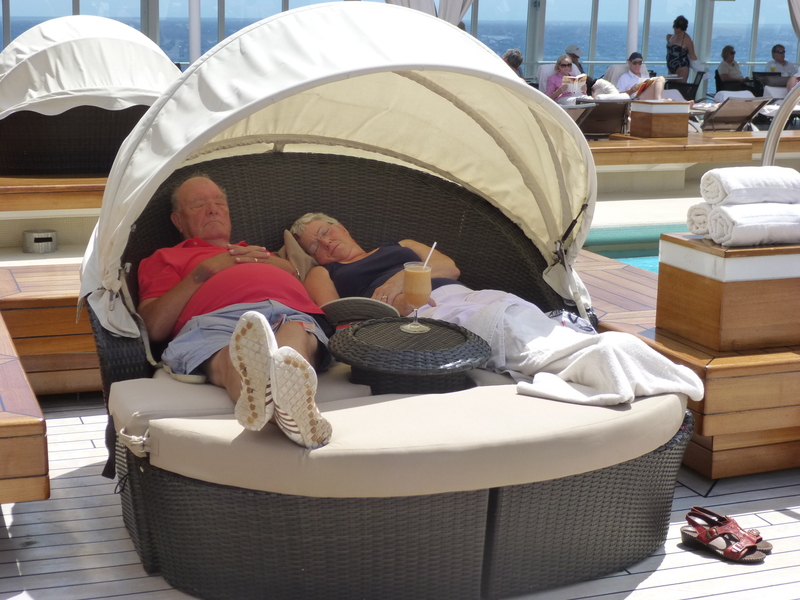 We were going on a long Seabourn trip this Jan but M decided to unretire! One day, one day…. You both so deserve this trip after what you had to endure up the west coast of Africa!